Fordingbridge is a town and broader civil parish with a population of 6,000 on the River Avon in the New Forest District of Hampshire, England, near to the Dorset and Wiltshire borders and on the edge of the New Forest, with museum and a late medieval 7-arch bridge. It is 81 miles (130 km) southwest of London, and 10 miles (16 km) south of the city of Salisbury. Fordingbridge is a former market town. The Avon Valley Path passes through the town. The town excluding linear settlement Sandleheath (included in its headline population with other outlying houses, totalling 1,526 residents) has a density of 30.2 persons per hectare. Fordingbridge is a town and civil parish in Hampshire on the banks of the River Avon. The first Great Bridge, from which the town received its present name, was built in mediaeval times, and is upstream from the ford. The bridge is a major feature of the town with its seven graceful arches, which can be seen very easily from the town's large riverside park where one can walk along the riverbank draped with willows and waterside plants. Close by is a children's play area, secluded memorial gardens, parks and sports playing fields. A bronze statue of the painter Augustus John stands on the banks of the Avon near the Great Bridge. Not far from the High Street is the parish church of St. Mary the Virgin which has some typical Norman characteristics. Lands in Fordingbridge and the advowson of the church were granted to King's College, Cambridge in 1447 by Henry VI, after being given to the Crown by Humphrey, Duke of Buckingham. The Fordingbridge Museum, with many local and forest history exhibits, and the Visitor Information Centre are in King's Yard. A roman villa is in Rockbourne 5 km north-west, which is open to visitors during the summer. The local comprehensive school is The Burgate School And Sixth Form Centre, in Burgate, a small hamlet to the north of the town. Fordingbridge Hospital is a small community hospital on the site of a Victorian workhouse. Most of the old buildings remain but the inpatient ward is a more recent addition. The town's medical centre is on the same site in Bartons Road. Since 1982 Fordingbridge has been twinned with Vimoutiers in Normandy. Fordingbridge is also home to Fordingbridge Turks FC, one of the 50 oldest football clubs in England, established circa 1868. The Turks name seems to derive from wishing to emulate the determination shown by Ottoman forces at Siege of Plevna. The recreation ground is also home to Fordingbridge Rugby Club, who have been one of the more successful Hampshire clubs in recent years. The parish of Fordingbridge contains the hamlets of Burgate to the north, Criddlestyle to the east, Bickton to the south, and Ashford to the west. Burgate and Bickton are settlements dating back to the time of the Domesday Book, and Bickton was in male heads of households greater than Fordingbridge in 1086. Criddlestyle is an ancient manor, also known as East Mill, with a history dating back to the 14th century. The largest hamlet today is Ashford, which was the location of an ancient watermill, and hosted Fordingbridge railway station until it was closed in 1964. Fordingbridge is recorded in the Domesday Book of 1086 under the name Forde. The manor was held by a certain Robert from "Robert the son of Gerald". Prior to 1066 it had been held by Alwy from King Edward. At the beginning of the 13th century Fordingbridge was held by Hugh de Linguire, who, dying around 1231, left a niece and heir Alice, wife of William de la Falaise. From that date Fordingbridge followed the same descent as Rowner. The manor was held by Elias de la Falaise at his death in 1254, and his brother William died in possession of the manor in the same year. Before 1277 the property had escheated to the Crown by the felony of William de la Falaise, grandson of William, and was granted in that year to Sir William le Brune, chamberlain to the king. The manor then stayed solidly in the Brune family until the death of Charles Brune in 1769, when the family became extinct in the male line. By his will his estates eventually devolved onto his grand-nephew the Rev. Charles Prideaux-Brune of Prideaux Place, Padstow, Cornwall, and the manor then remained in the possession of the Prideaux-Brune family. The lord of the manor had a market before 1273: it was held weekly first on Saturday and then on Friday until the middle of the 19th century, when it was discontinued. A fair was held on 9 September. From the 13th to the 15th century Fordingbridge was governed by a bailiff, and then in later centuries by a constable chosen yearly at the court leet of the manor of Lower Burgate. The constable was the chief officer until 1878, when government by Local District Council was established. A fire in the town in the 18th century destroyed many of the houses, which were never rebuilt. The Town Hall, built in 1879, is almost in the centre of the town. Cloth was made here in the 16th century, and in the 19th century there were factories for the manufacture of sailcloth and canvas and the spinning of flax. By 1900 the chief industries of the town were the manufacture of sailcloth and canvas and the making of bricks and tiles, and there were various flourmills, an iron foundry, and the Neave's food works. Fordingbridge railway station was closed in 1964. 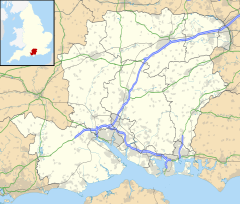 It was originally just outside the town, on the road leading to Sandleheath village, and connected the town with Salisbury to the north and Poole to the south. The first bridge at Fordingbridge was built before 1252, when the bailiff and men of the town received a grant of pontage for one year towards its repairs. Several similar grants followed, the last being dated in 1452. The bridge is 40 metres long and consists of seven stone arches. The bridge brought much traffic through the town. At the east end of the bridge was a Saint John the Baptist Hospital (hospitalry) for poor travellers. It was founded 1272, and dissolved 1546; some foundation walls remain, but no other remains. A custom which survived until 1840 obliged the lord of Fordingbridge during one summer month known as "fence month" to keep the bridge guarded and arrest anyone found taking venison from the New Forest. Significant alterations were made in 1841 when both sides were widened, adding 45 cm to the width of the bridge. The original arches are still visible, being smaller in span than the 19th-century additions. A reinforced concrete footpath on one side was added in 1901 to widen the bridge. In February of 2019, the bridge which is located on Bridge Street was closed for maintenance for a period of four weeks starting on the 11th February 2019. The work included blockwork replacement and carriageway resurfacing. The church of Saint Mary was originally a 12th-century building. About 1220–40 the church was greatly enlarged and practically rebuilt. A tower was built in the 15th century. In the 19th century the south vestry was rebuilt and enlarged, and a second vestry added. There was also a great deal of renovation. The church has a memorial to James Alexander Seton, last British person killed in a duel in England. Brookheath (50°57′05″N 1°48′37″W﻿ / ﻿50.951430°N 1.810175°W﻿ / 50.951430; -1.810175) is a small hamlet near Fordingbridge. It lies outside the New Forest National Park. Tinkers Cross (50°56′26″N 1°47′49″W﻿ / ﻿50.940420°N 1.797037°W﻿ / 50.940420; -1.797037) is a hamlet in the New Forest National Park of Hampshire, England. Fordingbridge is approximately 1.1 miles (1.8 km) south-east from the hamlet. East Mills (50°55′41″N 1°46′26″W﻿ / ﻿50.927979°N 1.773777°W﻿ / 50.927979; -1.773777) is a hamlet in Fordingbridge on the River Avon, approximately 1.2 miles (2.4 km) away from the town centre. William Ernest Brymer - (1840-1909) - politician and a Member of Parliament was born in Fordingbridge. ^ "Town population 2011". Neighbourhood Statistics. Office for National Statistics. Retrieved 8 December 2016. ^ Gannaway, Norman (1993). Fordingbridge Turks Football Club,1868–1993. p. 8. ^ "Bridge Refurbishment February 2019". Retrieved 20 February 2019. ^ Ross, David. "Fordingbridge, St Mary's Church". Britain Express. Retrieved 23 August 2014. ^ "BBC Inside Out". BBC. 2 October 2006. Retrieved 17 March 2007. Wikimedia Commons has media related to Fordingbridge. This page was last edited on 23 February 2019, at 12:59 (UTC).